"The Messenger - The Thunderbird"
Well, I've once again survived two plus weeks of the Sirius Rising Festival and then Starwood in Western New York. It's kind of a complete emersion experience, with some 2,000 diverse and eclectic people with tents and art and drums and encampments roll in. As before the Bonfires were extraordinary. 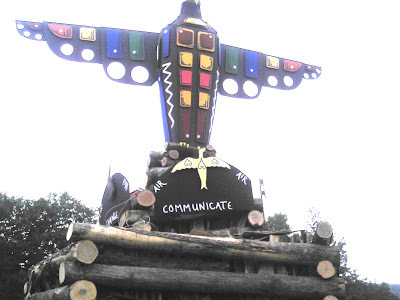 Above is the "messenger" this year, representing the element of air, the Thunder Bird. I will try to get a photo of it going up in flames, which was amazing, to see the great figure, designed and created by Leslie and Jason, becoming a great fiery bird. When the sparks went up far into the night sky, I felt like indeed all of our prayers and hopes were going up into the spirit realms with it. 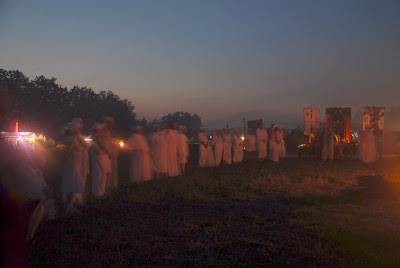 The Labyrinth was amazing as well, high on a hill, with some 1500 luminarias forming the labryrinth. At twilight, to see the shadows of people moving throughout to the center is a beautiful thing. --I have been offered a 6 month teaching residency at the Wesley Seminary School in DC next fall to pursue my Spider Woman Project. --This morning a little spider had made a nest (and was sitting in it) right on top of my medicine box, where I keep all of my various pills and inhalers and bandages. Spider Woman Medicine indeed! All Photographs here are courtesy of Roy Jones. In 2005 at the I Park Artist's Enclave in Connecticut it was the custom for residents to leave behind something for the scrapbook, as well as a creative recipe for a cocktail. Because I spent two months utterly blissed out in a creative fury there, my contribution was the "Artist's Oracular Cook Book", cards with commentary on the back. I always meant to get around to publishing them, but like the other books that are in my files, I never did. 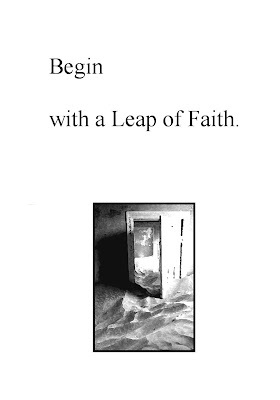 It seems to me that a creative act, like a creative life, really does, after you take a good look around, have to begin with a leap of faith. Faith in yourself, faith in some greater web of minds and being and continuum you are a part of, faith in the sheer beauty and delight of the process, faith in what you'll learn from it when you're (theoretically) "done". Here's something my friend Felicia providentially sent to me recently, about creativity, and the Muse. As you come near the glass, she approaches from the other side to meet you. You lift your pen, and she raises hers to touch its tip in the other world. You begin to move your hand and words form on the glass on her side, the other side. Patiently, you now follow her pen; you hear what she is writing, but dimly. You can see a little bit into the images she is creating. Can you read what she is writing? I'm telling you the story she is thinking. I'm pleased that I'm almost finished with the Spider Woman book - the proof copies I received look good, in fact, the illustrations are terrific! I' m excited about the continuing possibility of publishing in this way limited editions of art books, my own and those of others. 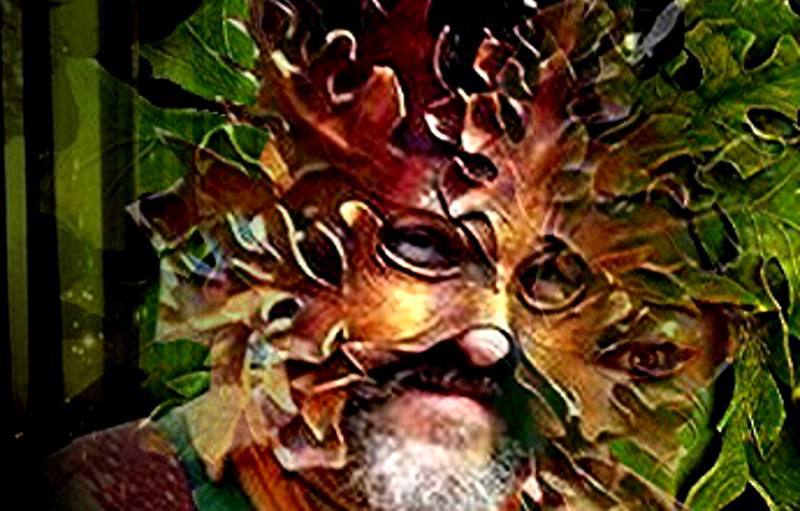 Now I'm working on the challenging effort of making a photo and text document of the "Masks of the Goddess" project. Stories don't end after two hours in a theatre, or when we turn off the electronic box. When we talk about “spinning a good tale“, like the hands of Spider Woman, we’re participating in something that keeps spinning and evolving, generation into generation, from the waking world to the dreamtime, back into the past, and forward into the stories of those who are yet to come. Spider was the first weaver, bringing order and form, balance and symmetry to the primal, formless chaos. The Navajo (who call themselves the “ Dine”) revere Spider Woman (Na'ashje'ii sdfzq'q) for teaching them how to weave. To this day, when a Navajo girl is born a spider web is rubbed into her hands so she will become a good weaver. Wool rugs often have “Spiderwoman's Cross” woven into the pattern, representing balance, the gestalt of the four directions, and Navajo weavers traditionally leave a flaw in the work - because the only perfect web is that of Grandmother Spider Woman. "As with all metaphors, Spider Woman is a bridge that allows a certain kind of knowledge to be transmitted from the mundane to the sacred dimension.........they believe that an individual must undergo an initiation before he or she can be fully receptive to this kind of knowledge. Thus, to the eyes of the uninitiated, Spider Woman appears merely as an insect, and her words go unheard. But to the initiated whose mind has been opened the voice of this tiny creature can be heard. This is the nature of wisdom, conveyed through the metaphor of Spider Woman." The Pueblo cultures refer to the people from northern New Mexico to the Hopi mesas of Arizona who still inhabit their ancestral lands. They are descendants of the ancient Anasazi peoples, who built cliff dwellings and ceremonial centers throughout the area over thousands of years. In Pueblo mythology Spider Woman is also called Thought Woman or Creation Thought Woman, and with the Sun (Tawa) she creates the world by thinking it into being. The creative impulse, within this metaphor, originates from a primal center in the great Web, and is shared by all beings - an eternally generative thread expanding and being re-woven. Weaving and spinning, the creation of baskets, clothing and rugs from cotton (and later wool with the arrival of the Navajo and then the European) was of enormous significance to native America, just as it has been in other parts of the world. It was both a practical and a holy activity, and has almost universally been associated with women. Among the Maya of Mexico and Belize, Ix Chel was an important earth goddess, matron of childbirth, medicine, and weaving. She was perhaps reincarnated as the Aztec Goddess Tlazolteotl, “the great weaver”, illustrated in Aztec art holding spindles and with strands of cotton fibers in her earrings. Among the Osage, until little more than a generation ago, honored and important women had spiders tattooed on the backs of their hands. In order to lay out the four directions they required for ceremonial purposes, the ancient Maya used stones they called “spiders”. Many depictions of spider motifs in early American cultures have been found that show a cross within a circle (“Spider Woman’s Cross”). The spider and cross symbol can still be found associated with balance, the four directions, and as a central or unifying force among diverse cultures of the American southwest. In the southeastern U.S., shell ornaments belonging to early Mississippian people often show a spider insignia with a cross on its back. Almost a thousand years later, peoples from the southeastern U.S., among them the Cherokee, have important myths and symbolic imagery about Spider Woman. Cherokee legends say, for example, that Spider Grandmother provided the world with light by weaving a great basket to carry it and to contain it. Perhaps she was once Neith, the primal weaver of ancient Egypt. In Celtic lore she has her hand on the web of the Wyrd, and in India the great Jewel Net of Indra, wherein each gem infinitely reflects every other gem on the cosmic lattice. Among the Greeks she gave Theseus a thread to guide him through his labyrinth - a thread not unlike the same threads she casts to you, and to me, now and then, on our own journeys. And today? Well, there are many contemporary ways Spider Woman makes herself known. What the Legend of Spider Woman has to say now is of vital importance, and I think she represents an ancient paradigm that is also an emerging paradigm for our time. She's working very hard now to make us pay attention. A cultural paradigm is founded upon mythic roots - the "warp and woof" from which the ideas of a culture grow. So what are those threads? Do they show us how to “walk in beauty”? To create, and partake in life, with balance? Each of us is holding a thread, a lineage that goes back in time and extends far into the future, a weave we participate in with our thoughts, our dreams, and the manifest creative work of our hands. So perhaps the only real question is an ethical question, as well as a creative one. 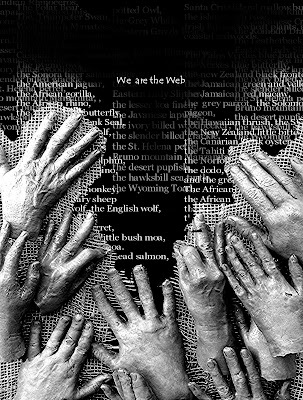 “ What are we weaving?” Estrangement or "a Webbed Vision"? I have found that Spider Woman delights in all things connected, co-creative, collaborative, cooperative, communicative - all those “co” words. Warp and weft. May we all be beautiful weavers, rubbing a bit of spider web into our palms.